Located near the heart of downtown Toronto this century old venue called Palais Royale is a great place to host your wedding. We love creating Palais Royale Wedding Photography in Toronto as it has some really unique features for places to hold weddings in the GTA. Palais Royale was once the shining dance hall located in the Sunnyside Amusement Park which is by now long gone from the lake front property to make room for the Gardiner Expressway and the expansion of Lakeshore Boulevard. This hall which has specialized in a big band feel over the years hosted many wonderful jazz and dance bands such as Duke Ellington, Count Basie, Paul Whiteman and the Dorsie Brothers. After falling on hard times through the mid 1900s the building was resurrected by a number of renovation projects and refurbishments and more recently has continued it's storied past by hosting such bands as Sloan and The Rolling Stones. It has continued to survive to this day by hosting weddings and events and has tailored it's renovations to draw the brides looking for an Art Deco feel to their day. The interior of the building has a very dark decor inside the main hall as the light is easily blocked out by the thick red curtains and the design of the building with the foyer running the entire length of the building. As such we have such an opportunity to take wonderfully moody photographs of the bride and groom. In the upstairs main room and the adjacent powder room we can create beautiful directional light pictures using the narrow windows and dark walls, or we can create photos of the bridal part with all it's members including the maid of honour and best man in the large dance floor area. Family photos can be taken in the front foyer as the large windows in this area provide bright even lighting on all the family and there is enough space to compose the image properly and have them look uniforms and clean. Downstairs in the bridal getting ready area the lighting isn't excellent as the room is filled with pot lights but that gives us the opportunity to shine as we bring along stead video lights and flashes which we can use to create our own light. We then have all the freedom we could ask for with creativity. On the back patio where the ceremony and cocktail hour are held the white tent and the light spilling in from the sides allow for wonderful ceremony wedding photography and great documentary pictures throughout the nuptials. As the day rolls to a close and the dancing is in full swing the dark walls of the hall really shine. We set up flashes on tall tripods and are able to pinpoint the light on the bride and groom as they share their first dance, as well as cover the touching moments of the bride and her father as they share their last dance together. The pics of the cake cutting, the garter toss and the flower toss usually finish off the night and help us to create one last page in the wedding album before the night closes. As it is centrally located along Lakeshoure Boulevard the Palais has excellent access to one of the finest photo locations in Toronto at High Park. This large Central Park offers treed and wooded areas, open fields, trails, interesting buildings, streams and ponds as well as excellent landscaping. Apart from that it is moments walk away from the Humber Bridge and the lakeside walking and biking paths which wind through parks and beaches. On the east is a walk down the pier with views of Toronto and wide open Great Lake Ontario, and right beside the building is a beach which though small is excellent for romantic close up portraits of the bride and groom. The antique ballroom and wooden floors offer about all the class you can handle at a wedding. A perfect dance floor and an in house lighting and DJ who will at times make a heart out of lights on the dance floor to share your first dance in. Many groom love this feature as well as the size of the overall dancing area. Because there is so much involved in the preparation of a day, the bride wants a large space where she and her girls can get ready before they walk down the aisle. The basement of the Palais is perfect for close family and friends and the bride and her getting ready posse to try on their dresses, make sure their hair and makeup is just perfect and to relax with some hors d'ouvres before saying I do. This is a big plus for those soon to get married. 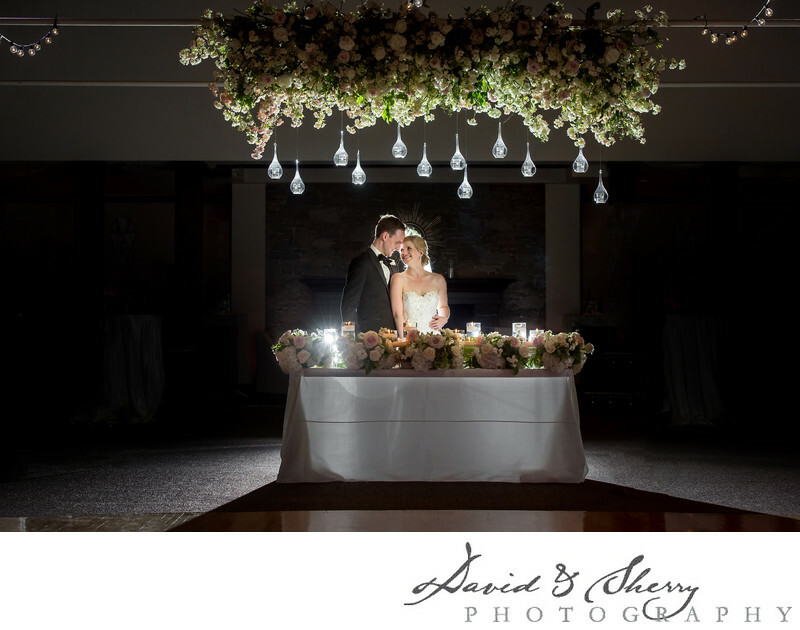 In this particular photo the decor designed by Rachel Clingen is prominently displayed with the bride and groom rim lit and side lit to showcase the design. The head table is draped with flowers and bouquets are hung from the rafters over top of the table with candlelights framing where the bride and groom are to sit for the evening. The bride and groom are posed together by their seats closely and intimately which is fitting for a day with this level of romance. They got married on the balcony with a full host of their family and friends watching on a hot summer's day and we were able to sneak them away during the cocktail hour to get some pictures with their decor before the day guests came in to fill the room. Right afterwards we exited the building to take the group and family photos and to document the family which came from all over the world to celebrate with the bride and groom. 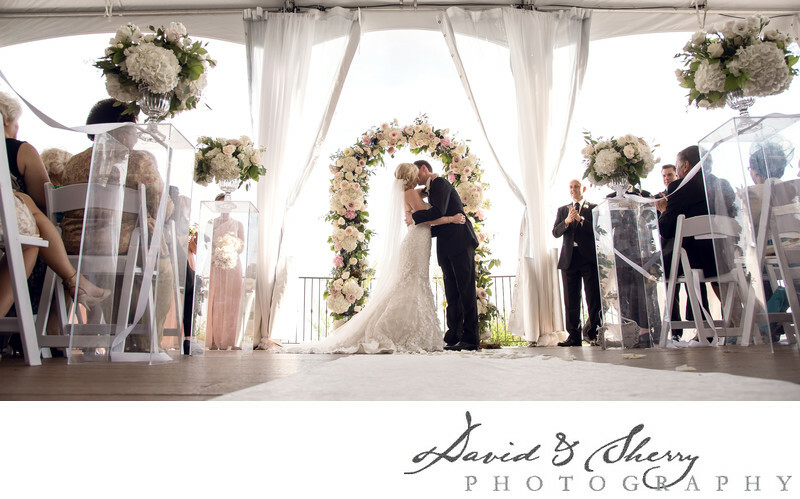 In all, Wedding Photography at the Palais Royale is everything you could imagine in it's beautifully designed spaces, it's great decor and the space to host the perfect wedding. Palais Royale is located on Lake Shore Blvd in Toronto. Location: 1601 Lake Shore Blvd W, Toronto, ON M6K 3C1.